If you’ve ever thought about starting a food blog and then thought about taking the leap to make that food blog your career, well you know, it can become overwhelming. Bjork and Lindsay Ostrom of the incredibly successful site Pinch of Yum have a suggestion for people dealing with the burden of trying to do it all. Just stop! In fact, Bjork challenges food bloggers to just focus on one thing and to improve it by 1% every day. That’s why he calls this his One Percent Infinity Improvement Plan. Wanna learn more? Read on! One thing I really love about Bjork and Lindsay is their passion for delivering quality content in a fun, playful manner. I think you’ll see that come through in their interview. Especially when we start talking about cat videos. Yes. Cat videos! How they came up with the name for their über popular site. How their blog has two markets, and they’re ok with that. How Lindsay’s love of cooking began as a hobby. The beginning of their monthly income statistics posts and how that led to the development of Food Blogger Pro. How food bloggers live with the the food narrator voice living in their head! Bjork’s obsession with Inbox Zero. A “Day in the Life” at the Pinch of Yum/Food Blogger Pro headquarters. Bjork’s favorite term, the One Percent Infinity Improvement Plan! The one concept that, once mastered, can free you up to eventually become the best you can be! How having high expectations can put too much pressure on our creative selves. Lindsay’s favorite part about food blogging. Is it the food? The writing? The photography? The story behind Bjork’s name! You may have to listen to the podcast just to hear this part! Learn more about today’s guests, Lindsay & Bjork Ostrom on their sites, Pinch of Yum and Food Blogger Pro. Lindsay mentioned this post on maintaining creativity by Shauna Nyquest on Stocking the Pond. Lindsay talks about her favorite planners including The Day Designer by Whitney English and her most recent favorite The Passion Planner. The best cat video on YouTube, the Cat Sail Video. It’s quick. You’ll make Bjork happy…just watch it! Check out Lindsay’s favorite music by none other than singer/songwriter…. Bjork Ostrom! Bjork’s favorite music Bon Iver (watch out…this site can make you dizzy!). Why not give Lindsay and Bjork a shout-out on Twitter or Instagram and say thanks for the Chopped Podcast interview. Check out last week’s episode on Being the CEO of Your Food Blog with Tessa Arias. You’ll love it! 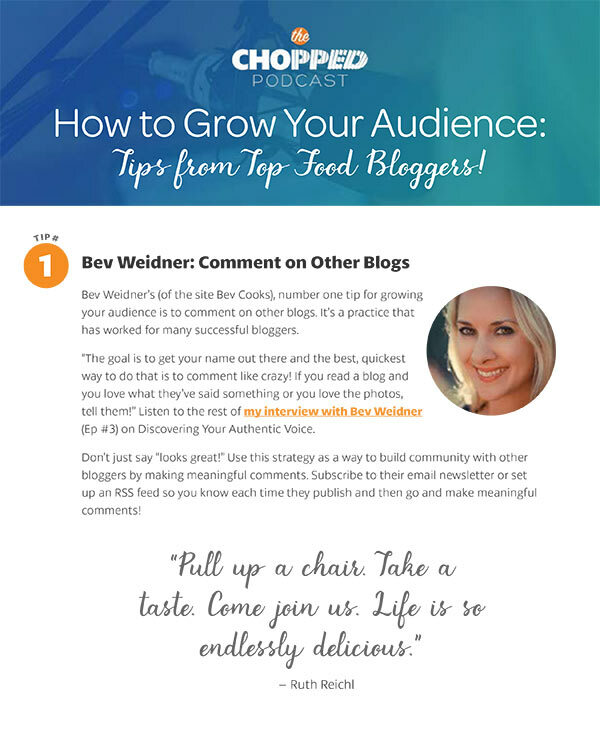 The next episode of Chopped Podcast will feature an interview with Bev Weidner of Bev Cooks. Bev and I talk about her awesome Instagram account, and the twins (of course!! ), and about how to find your authentic voice in your writing. Subscribe to the podcast to be sure you don’t miss it! I never listen to Podcasts. Not ever. Except I listened to this Whole Entire Thing. Thank you, Marly! So glad you liked the show. We will deliver more enticing content very soon (aka weekly!). Honestly, I can’t wait to share the upcoming podcasts – I think you’re gonna love them!